Over the last two days, 25 representatives from Eurodiaconia members gathered together in Helsinki for our study visit to the project “VAMOS for Young Asylum Seekers” run by our Finnish member Helsinki Deaconess Institute. The VAMOS project develops a new rehabilitative service for activation of young asylum seekers and is targeted for 16 to 29-year-olds who are waiting for their residence permit decision in Helsinki, Vantaa and Espoo. The activities are addressed to young asylum seekers, who have passed the age of compulsory education and are at risk of becoming idle. Therefore, beneficiaries take part in psycho-educative group activities, are encouraged to start new hobbies and have opportunities to make friends with people of Finnish background. This project also represents one of the best examples of integrated funding approach among Eurodiaconia membership, being successfully funded by both the European Social Fund (ESF) and the Asylum, Migration & Integration Fund (AMIF). 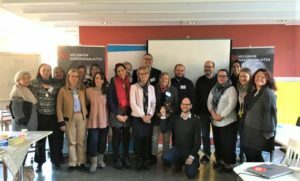 Besides the on-site visit to the “Vamos” project in Helsinki, the participants had the opportunity to learn more about three other successful projects on migration from Eurodiaconia members: “Kalunba Social Services Ltd” run by the Reformed Church of Hungary, Service to Migrants in Milan and “Servizio Migranti” in Piedmont developed by Diaconia Valdese, “DOMA – Diaconia offers opportunities to migrants” run by Diaconie ECCB. The project showcase session was followed by a presentation on best practices related to synergies between the ESF and the AMIF funds in Finland, given by the Adviser of the Finnish Ministry for the Interior Pauliina Eskola. To know more about the VAMOS project, please visit the Helsinki Deaconess Institute website.